Sorry Blog! I’ve been busy publishing my book. Path Unchosen is the title of my novel. It’s the story of an apprentice necromancer who discovers that someone is deliberately raising zombies. She risks her life, and her soul, to stop them before any more innocent people die. 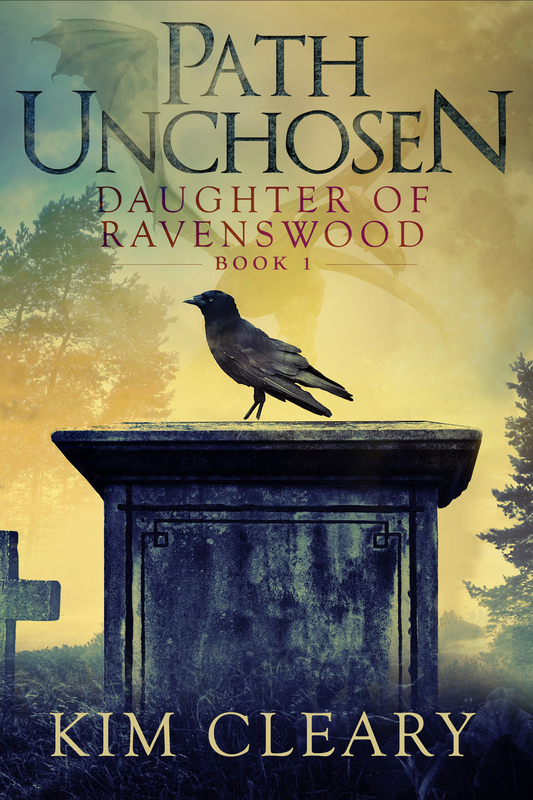 This book is the first in a somewhat darkish urban fantasy series I’ve called Daughter of Ravenswood. According to Dr. Carl Jung ravens symbolize our shadow selves, the dark side of our psyches. If we want to be whole we need to acknowledge and communicate with that dark side. Wholeness brings balance, and facilitates wisdom (something the wise raven would be very pleased with). It might be the end of the series before we see how much balance and wisdom my heroine achieves. Can you see the dragon? Nothing thematic here. I just like dragons, and can’t imagine writing a story without one! I am also pleased with the series and book titles. It’s funny though, as soon as you decide on a book title, you can’t remember or imagine any others. The hours, days, even weeks of indecision and brain pain are forgotten. What do you think of the cover? What does it suggest to you? Kim writes paranormal stories with a intrigue, suspense and a hint of romance. She loves all animals, especially her dogs; and thrives on coffee and chocolate while writing and researching. I love it. I think you’re spot on – just the right amount of creepyness. I find the colour great too. It’s unusual – couldn’t find another book on my shelves that was anyway near it. Perfect. Great cover Kim……looking forward to reading the series. Have you got any eBooks published yet? Been on LSL leave an kind of been off the grid. I think the cover gets it just right. It’s not my favorite genre to read, but it sounds like you are headed for popularity with a large segment of the reading public! Good job with the publicity efforts…you are doing everything right, and I know how hard that is. Thank you Gretchen 🙂 I’m not sure that I’m doing anything right! But I’m having a go and I guess that’s better than doing nothing lols. You may want to change your page address from “Oakswood-series” to “Ravenswood-series”. And the cover is gorgeous. Site is in final stages of construction Heather, thank you for pointing out the page address! Will get that sorted out 🙂 And thank you so much for stopping by and liking my cover. So pretty! Can’t wait to read this. Congrats! It’s a great cover, Kim! I think the most important thing any self-publishing writer can do is publish their work to the highest standard they possibly can, and the cover is the biggest part of that. Congratulations! It looks really amazing. Thank you Devin 🙂 really appreciate your feedback 🙂 thank you so much for stopping by!